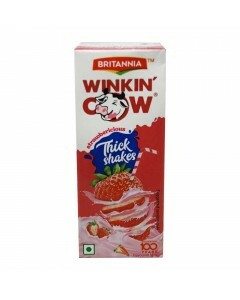 Britannia winkin cow Strawbericious shake, as its name says, is a strawberry drink made into a milk shake. This beverage is mostly relished frozen or chilled to best enjoy it. It is high on nutrition. Strawberry is widely appreciated for its characteristic aroma, bright red color, juicy texture, and sweetness. It is consumed in large quantities, either fresh or in such prepared foods as preserves, juice, pies, ice creams, milkshakes, and chocolates. It is an excellent source of vitamin c, a good source of manganese and offers numerous benefits to your health that make it all the more irresistible.